Kenneth John "Kenny" Sharp, 80, passed away Oct. 5, 2003 at DePaul Medical Center. He was born March 3, 1923 and was formerly from Fall River, MA. He is survived by his wife, Aspecia "Mary" Sharp; daughter, Deborah Sammarco; grandson, John Paul Sammarco and his wife Selby Tardo; granddaughter, Nicole Sammarco and her husband Steven Jefferys; and great-grandson, Gavin Xavier Jefferys. 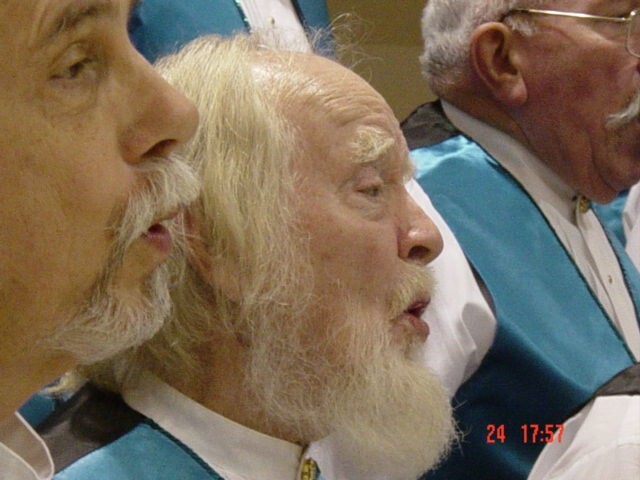 He was a veteran of World War II, served in the U.S. Navy, member of Colonial Avenue United Methodist Church, charter member of the Commodore Chorus and the American Legion. He was active in the Joy Fund Annual Show for 18 years and loved being Santa Claus at Christmas time and also being a Leprechaun on St. Patrick's Day. His hobbies were singing, gardening, chess and working on toys. In the late 70's and early 80's he was part of the quartet, "The Diehards" which consisted of Kenny on Lead/Tenor, Jim Eads on Tenor/Lead, Bill Glass on Bass, and a newcomer to barbershop, Dave Watts, on Baritone. A memorial service will be held at 11 a.m. Saturday at Colonial Avenue United Methodist Church. The Cremation Society of Virginia, Virginia Beach, is in charge of arrangements. Friends may sign the online guest register for Mr. Sharp at http://www.cremate.org.